Amazing Vodafone Offers are here with a lot of free surprises. Today, I am Sharing some of Vodafone Offers with my Readers like free Voda to Voda Free Minutes, Unlimited Vodafone to Vodafone Calling for 1 Year, Free Movie with Tuesday offer for Mumbai Citizens and many more such offers are listed in this post. Hope you are enjoying our posts and get benefits. First of all I want to Thanks to all those Readers who have Subscribed to My Whatsapp Channel to Receive Free Updates. If you not Subscribed yet, Subscribe to Our Whatsapp Channel to enjoy more premiums tricks and deals that we don't share on our Blog. Vodafone is Currently running a Refer a Friend offer for all its users. 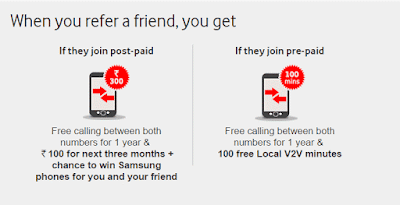 In this you earn Free Vodafone Minutes, Unlimited Calling etc for Referring your Friends to Join Vodafone Network. 1. 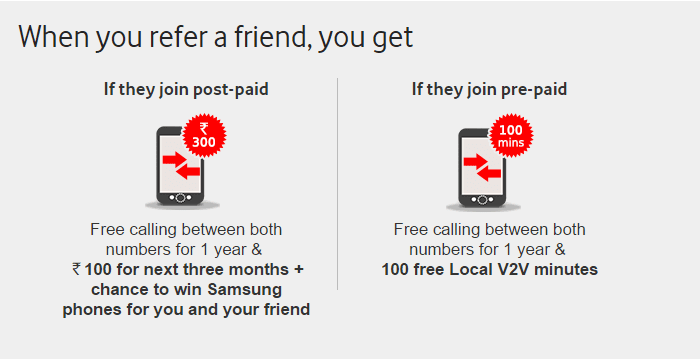 Refer a Friend to Join Voda Prepaid Network : When you Refer a Friend to Join Vodafone Prepaid Network Then you will get Free Unlimited Vodafone to Vodafone Calling between that two Numbers(i.e. Your and your friend's number) and 100 Free Local V2V Minutes. Vodafone is the Only Operator which Gives free and Amazing deals to its users. Vodafone Gifts its Users a Deal Every Tuesday. To Avail the benefits of this deals. Type TUESDAY and Send it to 56789 from your Vodafone Number. Just Send the above message and you will get amazing deals from Brand parteners like Big cinemas,Smaaash,Enrich,Mad over donuts etc. Unfortunately this Vodafone Tuesday offer is for Mumbai Citizens Only. Another Cool offer by Vodafone and this is Available for all Vodafone Users and in all Circles. To avail this Offer just Dial *121# with your Vodafone Number. Final Words: Don't Forget to Subscribe to Our Whatsapp Channel to Receive More amazing offers and Deals like this. Also, You can Contact us on Whatsapp for Any Query related to Our Blog.